On Sunday, March 17 , 2019, at 10:00 a.m., Cinema Art Bethesda will present the Israeli film, In Between (Bar Bahar). The film is 103 minutes long and in Hebrew and Arabic with English subtitles. It was released in 2016 and was the winner of 14 and nominated for 15 awards at 14 international film festivals. 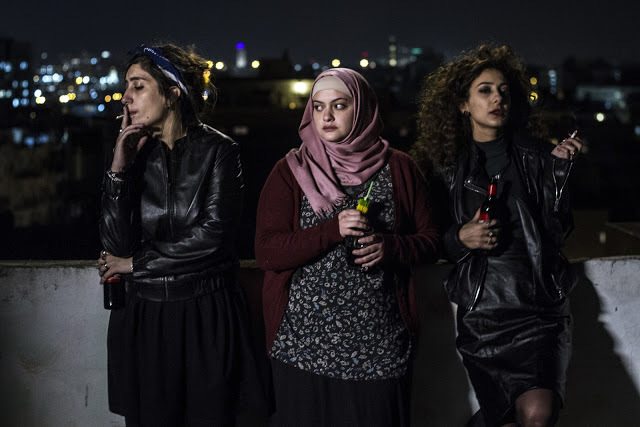 Maysaloun Hamoud’s remarkable debut feature In Between follows three strong and independent-minded Palestinian women who share an apartment in Tel Aviv. Away from the constraints of their families and tradition, they find themselves ‘in between’ the free and unfettered lives they are aspiring to lead and the restrictions still imposed on them by society. Laila, a successful lawyer, craves the love of a good man and thinks she’s found him in the apparently open-minded and handsome Ziad. Salma, while striving to fulfill her dream of becoming a DJ, falls for a beautiful doctor, but is forced to keep their love a secret from her family. Laila and Salma’s hard partying lifestyle initially comes as a shock to the more traditional and reserved Nour. She is engaged to marry a seemingly devout Muslim, who, behind closed doors, is not the man he appears to be. Eventually, a shocking series of events will push these brave women to the limits and change their lives forever, while also sealing their bond of friendship.